Fabien Lefevre is a well-accomplished cross discipline slalom paddler, having won World Championships in both kayak single (K1) and canoe single (C1), and a bronze and silver medal in the Olympic Games in 2004 and 2008 respectively. In preparation for his upcoming competitions, Fabien wanted the best equipment for his races. His vision was to engineer a new type of boat, a hybrid between a canoe and kayak, he would use in slalom canoe single (C1) and kayak single (K1) class competitions. The new boat would provide the flexibility of racing in two classes to accommodate both kneeling (canoe) and seating (kayak) positions. Fabien collaborated with GoMeasure3D on the design process. He was the conceptual designer while GoMeasure3D offered the technology and expertise to turn his concept into reality. Reverse engineering is a fast and cost-effective way to design the new boat without starting from a blank slate. This process would involve scanning his existing kayak into a digital 3D model. The scan data would contain all the kayak’s measurements so Fabien could analyze its construction with the intention of developing an improved design. The final output would be a CAD file that his sponsor would use to create a CNC machine-made mold for manufacturing. Fabien’s existing kayak was handmade and had existing deformities. Having boat symmetry on the left and right side is critical. Canoe/kayak slalom requires the paddler to constantly move with the boat in unison in rapid waters. If the boat is not symmetrical, it is difficult for the paddler to make body rotations, causing fluid dynamics issues affecting performance, and causing tensions to the lower back leading to long-term injuries. The new boat would need to be as symmetrical as possible. The first step was to scan the kayak into digital 3D modelthat would allow Fabien to analyze and customize the design according to his needs. The 3D scans needed to be as accurate as possible in order to get a true representation of the kayak’s measurements. The HDI Advance 3D scanner provided the accuracy that was needed for this project, up to 45 microns (0.045mm) per scan. Fabien’s kayak was made of black carbon fiber with a reflective resin finish. Dark, reflective, or transparent surfaces are difficult materials to scan. Magnaflux developer spray is a great tool to overcome this challenge. A thin white-powdered coating was applied directly on the kayak, making 3D scanning much easier by creating a matted surface. Once the scanning was complete, the spray was wiped off completely without causing any damage to the surface. 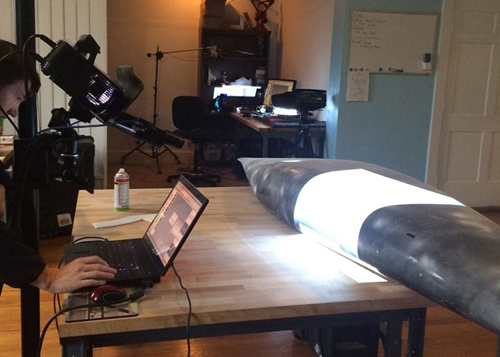 Scanning large parts can be challenging, especially a kayak that reached approximately 10 feet long. A complete 3D scan of the kayak could not be taken in one shot. The GoMeasure3D team used the HDI Advance 3D scanner to capture large segments of the kayak by taking multiple scans at various angles, which were later stitched together to create the full model. Photogrammetry markers were placed on the kayak to automated the alignment of 3D scan data. It significantly reduced the amount of time it took to merge and align the individual scans into a complete digital model. Otherwise it would been done manually which would be a time consuming process. 3D model of Fabien’s kayak. The digital 3D model of the kayak revealed its nose was bent to the left, which was causing the kayak to pull in that direction while paddling. Other deformities were found that needed to be corrected. Fabien also wanted to make improvements to the boat, such as adjustments to the volume and the shape of the kayak’s bow. He customized the new design according to his needs. These modifications would be incorporated into the final CAD model using reverse engineering software. The scan data served as a reference to model a new CAD model using SpaceClaim and Geomagic Freeform software. SpaceClaim, a direct modeler, created the CAD model with precision without the complexities of a featured-based CAD modeling software. The Touch haptic 3D stylus and Geomagic Freeform made it easy and intuitive to model organic forms where the boat’s spraydeck would need to precisely fit into the boat. The final CAD model was created with 100% symmetry on the left and right side. The conceptual design was sent to Fabien’s sponsor for production. Upon receiving the CAD file, Fabien’s sponsor created prototypes of the new boat for Fabien to do test runs during his practice. Fabien used the new boat’s prototype to conduct test runs before final production. The final boat is expected to be in production soon. Learn more about Fabien by visiting his website at www.fabienlefevre.com.